This recipe is really easy to put together! I opted to use (skinless, bone-in) chicken thighs rather than chicken breasts and started with a little over 1 1/2 lbs. Simply place the chicken in the slow cooker and mix together the ingredients that will flavor the chicken. It's a blend of soy sauce, hoisin sauce, Thai sweet chili sauce, balsamic glaze, honey, and garlic. Lucky for me, I have most of these ingredients sitting in my pantry. The one thing I don't have is balsamic glaze so I used a spoonful of balsamic vinegar; it's not exactly the same but I think I still get a bit of that complex flavor profile. All you have to do is pour this sauce over the chicken, along with a chopped onion. I gave it a little nudge and stir and let it cook for about 4 hours on low in my slow cooker. I can't leave well enough alone so I went in to give it a stir once or twice but you can just go about your day while dinner's cooking away. After 4 hours or so, you have this marvelous mahogany-colored chicken that you can pull apart with 2 forks. You can take the sauce/juice straight from the slow cooker and use it to moisten the chicken. I wanted to thicken it somewhat so I transferred the sauce to a small saucepan and thickened it with a little cornstarch slurry. This way you have a bit of a glaze that will stick to the meat better. I ended up adding more and more of the sauce as I was putting each slider together! You can top the chicken with some toasted sesame seeds or add a little hot sauce for extra spice. Have fun! I know we had a fun time gobbling up these sliders! Kelly...your book rocks! I know you did your mom and family proud. Thank you for sharing your wonderful straightforward recipes with us. I just love that you included a photo for each recipe so I can picture it on my dining room table! I already have my eye on the Vietnamese pork chops and would love to cook up the eggplant for my mom. It'll happen soon! Place chicken directly into the bottom of your slow cooker. Combine the soy sauce, hoisin sauce, chili sauce, balsamic glaze, honey, garlic, and pour evenly on top of the chicken. Scatter the onion on top and give everything a light stir. Cook on low for 4-5 hours (I gave it a stir midway). Transfer the chicken to a cutting board and shred into thin strips using 2 forks. Take a little of the sauce/juice* and stir it into the shredded chicken to moisten. 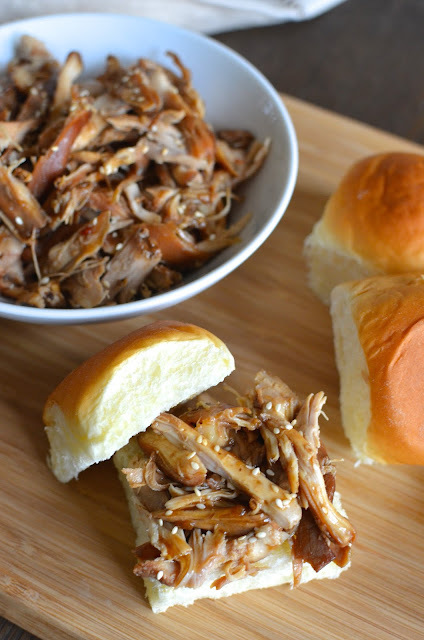 Fill slider buns with the shredded chicken and enjoy! * If desired, you can do like I did and transfer the sauce/juice from the slow cooker into a small saucepan and thicken it with a cornstarch slurry. I mixed about 2 teaspoons cornstarch with 4 teaspoons cold water. Over medium heat, stir about half the slurry into the sauce until thickened. Add a bit more slurry if necessary to reach the desired consistency you prefer. Wow! Looks great! The tendered and flavorful meat sure make me eat more sandwiches! o yes, I love Kelly's recipes too. These sliders look amazingly delicious with the honey garlic chicken. Its a gorgeous recipe! Simple to make but packed with flavour. I love the cover too...everything looks so delicious. Don't you love that - easy, simple, but good. I love the cover, too, and the photos inside are wonderful as well. There's one with each recipe which is practically a must for me. What a great recipe and a beautiful review of a well deserving blogger. Thank you for sharing this cookbook - I will have to check it out asap! Have a wonderful week Monica. Yes, do check it out, Tricia! The sliders sound terrific. Perfect to serve when you have a group over for a football game. Hi Kelly! : ) Kudos again to you on the book; I love it!! Needless to say, your family is so lucky to have you and to enjoy your awesome cooking. I loved reading about your mom and how much of an influence she is on you; she must be so happy and proud! : ) I can't wait to try other recipes soon. I want to eat everything - each dish looks so great, beautifully captured! Hi Monica, Kelly does have wonderful recipes, I will have to pick up a copy of her book. I just started cooking seriously with a crockpot about 2 years ago and very much enjoy the process. Delicious lookimg sliders. Yes, love the slow cooker recipes with an Asian bent. A big kudos to Kelly! Awesome news and what a delicious looking slider. I just received a slow cooker for my bday this year and looking forward to giving it a workout. Yay for Kelly and her terrific book. I know you'd love cooking in a slow cooker. Hope you share some recipes soon!! Yay! Many congratulations to Kelly. I love her site and recipes, she is indeed a super Mom. This book has such a wonderful collection of slow cooker recipes. These honey garlic Kitchen sliders look so yummy like most of her recipes. YUM YUM! Wonderful share, Monica. Yes, she's a hardworking super mom for sure! : ) This was very tasty and I can't wait to try other recipes soon! Recipes like this make me wish I had a slow -cooker, they are not popular here. Any idea how to bake this in an oven with similar results? I am drooling and I know for sure we would all love this. There are no words for this. You have made me SO hungry. What a great idea and it sounds like a fab book. It definitely hit the spot, Caroline.